SAVE BIG when you purchase the Kindergarten Guided Math Bundle HERE! Do you have a few extra moments? Watch a detailed videos about this curriculum HERE! What are the Kindergarten Guided Math Units? Kindergarten Guided Math units are teacher-created, kid-tested, and most importantly kid-approved! Kindergarten Guided Math takes away that monotonous way of teaching math where students sit and listen to the teacher TEACH math. Instead, Kindergarten Guided Math encourages guidance from the teacher while the students TEACH and LEARN math through hands-on and engaging math activities with their partners. Kindergarten Guided Math units are made up of 10 instructional days each, but can be adjusted to fit your classroom needs. The units include assessment pieces as a way to ensure student growth over the unit. These are just a few highlights you’ll see using the Kindergarten Guided Math Units; kids talking about math, kids using manipulatives, activities that are fun + engaging, learning that requires critical thinking! Kindergarten Guided Math curriculum is a 35 week math curriculum that includes lesson plans that break down a 45 minute block math time. 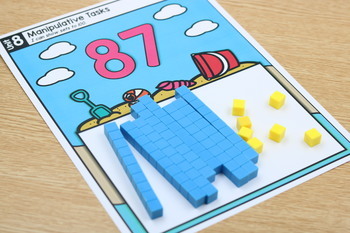 The units will also include any and all cards needed to make the lessons successful! You will just need to provide the manipulatives like teddy bears or cubes! 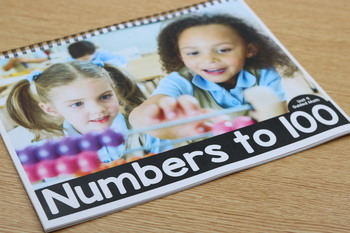 Kindergarten Guided Math is a simple print and teach math curriculum. No more tracking down ideas, worksheets, cards, etc! I have it covered! What is included in Kindergarten Guided Math Unit? Tell me more about the Kindergarten Guided Math! Lesson Plans: 10 sheets of lesson plans are included for each unit. You will also have access to editable lesson plans if you would like to edit. Pre/Post Assessments and assessments tracker: A five question pre and post assessment is included. There is also a matching assessment tracker. The tracker can be used for informal or formal assessing. 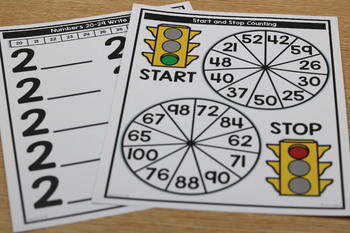 Vocabulary cards: Each Kindergarten Guided Math unit includes a vocabulary focus. Vocabulary cards are included within the unit. Think and talk images: Kindergarten Guided Math includes Think and Talk math images. These are built into the lessons. Interactive notebook pages: Interactive notebooks pages are included for every math lesson. Aligned center mats: LOW prep aligned center mats are included for every math lesson. Manipulative mats: A variety of hands-on manipulative mats are included for each unit. The mats are open-ended and can utilize various manipulatives you already have access to. Daily printables: Each lesson has an included practice sheet. Custom INCLUDED books: Each unit has a custom included book. The book has a daily opportunity for students to apply the skill with critical thinking starters. How is the Kindergarten Math Curriculum completely ALL-INCLUSIVE? Kindergarten Guided Math units are set up to be a comprehensive guided math program that includes necessary items for the TEACHER and STUDENTS. Below is a breakdown of the Kindergarten Guided Math and how it is set up to cover the needs of the teacher and students. Teacher has a small-group of students at the small-group table for leveled differentiated groups. Teacher meets with three+ differentiated groups per day. Groups are broken down by below level, grade level and above level. 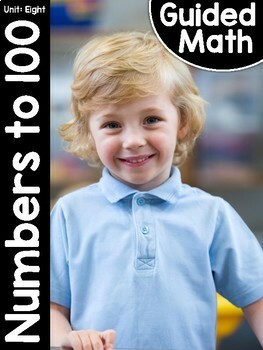 The Kindergarten Guided Math program includes 10 differentiated guided math lessons per unit. Resources are included to engage the students in each differentiated lesson. The students that are not back at the teacher table will participate in independent or partnership activities. All of these activities are included. Station 1 (Interactive Notebook): Interactive notebook sheets are included for each lesson. Station 2 (Manipulatives): Manipulatives mats are included for the unit. Station 3 (Hands-On Center): Aligned center mats are included for each lesson. Station 4 (Apply): Daily printable practice sheets are included for each lesson. A closer look at the unit lessons! Would you like to receive notifications for my newly released packets and upcoming sale? Be sure to FOLLOW ME here on TPT! **Join my private Facebook Group to join fellow Pre-K, Kindergarten, First Grade and Second Grade teachers that use my curriculum! Collaborate, chat and share ideas with like-minded teachers! Join the private Facebook group H E R E!